Place 16credit from the bank on Eve Campaign when it is rezzed. When there are no credits left on Eve Campaign, trash it. When your turn begins, take 2credit from Eve Campaign. Eve lies on the extreme of a long curve of economy cards. Her net profit is 11. That's a totally absurd amount of money for a card and a click. Her drawbacks are equally huge. Assuming you rez her at the end of the runner's turn, you still have to wait through two more of their turns before she's even turning a profit. That's a huge delayed reaction that will put short term pressure on your economy, quite apart from the fact that any halfway decent runner will be looking to trash Eve as a high priority. 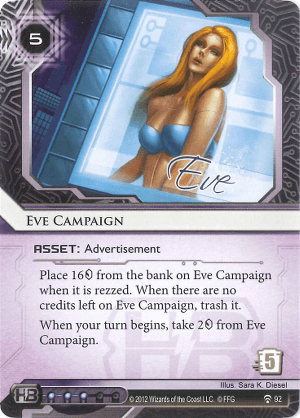 Eve's high trash cost makes her a punishing tax on the runner in a naked remote, but that's offset by her equally high rez cost. In a scoring remote she's pretty much invincible, but her frustratingly slow pay-off means you run the risk of building up agendas in hand while she does her beautiful financial magic. Sometimes it's the right answer to trash eve in favour of an agenda. The more money you pass up to do this, the more it telegraphs to the runner that they should be looking to check out your remote.